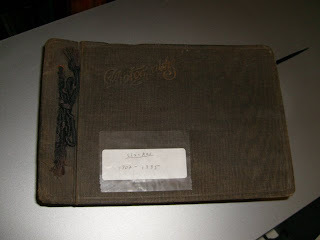 I am starting to scan and restore images from an old album of my grandmother's, marked "Clarkes 1902-1935." To do this I had to take it apart, but fortunately this one has a tied binding. Some of the other albums are going to be trickier. 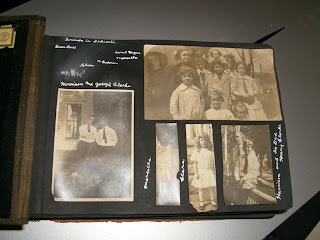 It is another black paper album, and is quite worn. The photos tend to have too much or too little contrast, and some silvering. There are a lot of hand-written comments in white ink, but many of them are difficult to read. I'll try to do restorations of some of the more promising images. Here's a detail of one of the clearer photos, a scan prior to any cleanup. 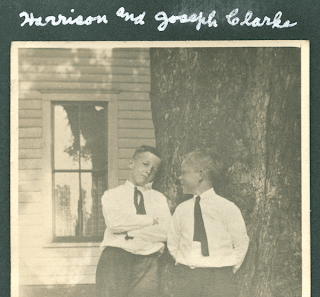 It shows Joe and H. Harrison Clarke, Marcella's brothers. 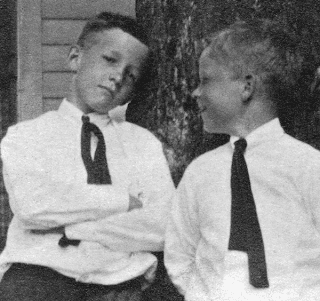 It isn't dated, but 1912 seems like a reasonable guess; H. Harrison Clarke was born in 1902. I'm scanning these at 1200 dpi, to try to capture any fine detail that is lurking in the grain. Here's a first attempt at cleaning up dirt and scratches on the image and adjusting the contrast. 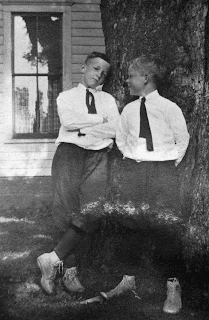 Take a look at the blousy shirts, the ties, the pantaloons, and the shoes! Retouching is a compromise; I've used Photoshop's spot healing brush along with my Wacom tablet to blend out a lot of dirt and scratches. That's an endless process, though, so at some point you have to stop and focus just on the faces and most visible damage. If you get too aggressive with the spot healing, then you start to get a plastic-looking surface, and if you clean up one area very thoroughly and leave other areas dirty, it looks strange and uneven. Also, at this point I'm not even going to attempt to clean up the whitish rubbed areas across the middle of the picture; it's beyond my current retouching skills. To bring up the sharpness, I hit the unsharp mask filter pretty hard. The image starts to look a little grainy, but you get some details back that tend to look blurry if you don't sharpen them. It's a compromise and I'm still learning how to get the best results. Of course, I'm also preserving both the original paper album as best I can -- although in another hundred years the acidic black paper will have probably rendered the images even more illegible -- and the original scans, for someone else to play with in the future. That someone might be me in a few years.